March 4th Update: Female tickets are sold out! 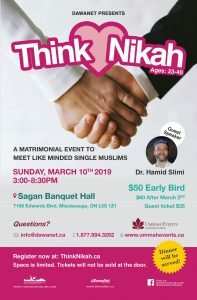 Ummah Events is pleased to partner with DawaNet once again to bring you the next matrimonial event, Think Nikah on Sunday, March 10, 2019 at Sagan Banquet Hall in Mississauga. We understand the challenges single Muslims have in meeting potential marriage prospects due to busy work schedules, religious constraints and general lack of platforms to meet like minded Muslims in appropriate settings. Our matrimonial events provide a great opportunity to meet single Muslims in a comfortable, relaxed and organized atmosphere. Please note: The news host refers to “religious speed dating”, but our events are not speed dating events. Please refer to our Frequently Asked Questions for more information.